Alison Kern teaches her final session of Kindermusik in Albion June 30. 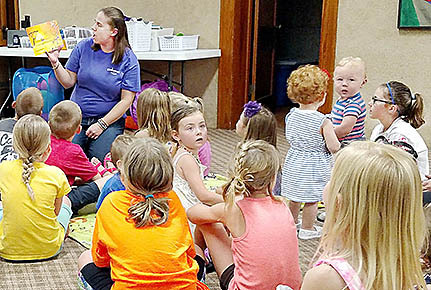 Many families who are longtime participants in Albion’s Kindermusik program gathered on Thursday, June 30, to play and sing together one last time before the program closes. Owner and licensed Kindermusik educator Alison Kern is closing up shop after six years in Albion, because her family is moving to the Kansas City area in late July. Kern will continue teaching the music and movement classes as part of a large Kindermusik program in the Kansas City area.